NPL N.O. Shock is designed for fitness enthusiasts looking to boost performance, increase energy and get the most from their workouts! This preworkout has been formulated using clinically tested ingredients that assist in improving training performance, stamina, as well as mental alertness and focus. NPL N.O. 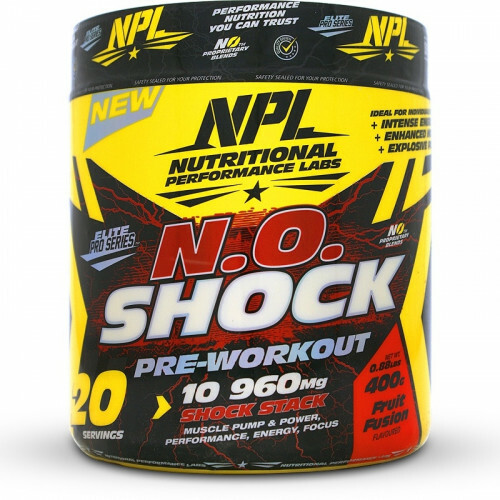 Shock has been designed to enhance muscular endurance by reducing the build-up of acid in the working muscle as well as to facilitate ATP production – the biochemical energy store used during high-intensity exercise. In addition, this product contains ingredients that have been shown to improve cognitive function and blood glucose utilisation, ultimately improving mental focus and energy levels during training. * % NRV - Nutrient Reference Values for individuals order than 4 years. CARB MATRIX: (Maltodextrin, Fructose, Palatinose), Beta Alanine, Creatine Monohydrate, Taurine, L-Tyrosine, Frutaric Acid, Beetroot Powder, Flavouring, Caffeine, Green Coffee Bean, Anti-Caking Agent, Guarana, Siberian Ginseng, Theanine, Salt, Non-Nutritive Sweetener (Sucralose), Grape See Extract, Advantra Z, Nicotinic Acid, Vitamin B6 (Pyridoxine HCL), Colourants. Mix 1 rounded scoop (20g) with 200ml of cold water and drink 15 minutes before training. Individuals sensitive to stimulants should start off by using half a scoop. Do not exceed more than 3 scoops within a 24 hour period. Any persons suffering from anxiety or depression, those with diabetes, or those using blood thinning medication (such as Warfarin), should consult their healthcare practitioner before using this product. Discontinue use of this product at least 2 weeks prior to any scheduled surgical procedures. Always inform your healthcare practitioner when you are using other medication. If you are pregnant, or breastfeeding, please consult your doctor, pharmacist or other healthcare professional for advice before using this product. Discontinue use should you experience any adverse signs or symptoms when using this product. This product may contain dietary ingredients that are prohibited by individual sports organizations. Due to the unique restrictions of some amateur and professional sports organizations, obtain approval and / or authorization before beginning use of this product. Use this product as directed, do not exceed recommended dosage.